A disputed territory in the central Balkans, Kosovo is considered by many nations to be Europe's newest country. The independent state, once part of Serbia, has no shortage of colorful history. Tourism in Kosovo remains a small industry, and visitors will witness the scars of war as recently as 1999, when Serbia revoked the territory's autonomy. Today, Kosovo is mainly ethnically Albanian, with a Serb majority in the north, as well as large numbers of ethnic minorities. Active UN troops still work in the country, guarding Serbian monasteries that date back to the 13th and 14th centuries. Despite this, Kosovo is a safe and stable country to visit for those who want to explore off the beaten path. The mix of World Heritage Sites, wild countryside, and welcoming hospitality will surely draw more and more visitors as the word gets out. Pristina: Brimming with modern restaurants, trendy cafes, and youthful exuberance, Pristina is an energetic city with plenty of Kosovo tourist attractions. Prizren: The quaint mountainside village of Prizren boasts a medieval fortress, a World Heritage-listed church, and an intriguing blend of Serbian Orthodox and Ottoman architecture. Peć (Peja): Peć, or Peja, preserves Ottoman and Serbian Orthodox heritage including a World Heritage Site and monastery. The town is also a hub for sporting events. Ethnographic Museum (Muzeu Etnologjik): Learn about the Kosovar-Albanian people through exhibits of their traditional costumes, furnishings, and handicrafts at Ethnographic Museum (Muzeu Etnologjik Emin), authentically set in an 18th-century house. Kalaja Fortress: Once the capital of the Serbian Empire, today the ruins at Kalaja Fortress mostly date from the Ottoman era. The hilltop site offers panoramic views of the surrounding scenery and Prizren below. Kosovo Museum: Housed in a colorful Austro-Hungarian building, Kosovo Museum showcases the country's long history and culture. Gracanica Monastery: Perhaps the most sought-out Kosovo attraction is World Heritage-listed Gracanica Monastery, whose stunning church features a blend of Serbian Byzantine and Renaissance styles, plus 14th-century frescoes. Skanderbeg statue: Paying tribute the country's 15th-century hero, the Skanderbeg statue forms the focal point on a plaza of governmental buildings. Mother Teresa Cathedral: Erected in reverence of the famous missionary, Mother Teresa Cathedral is a grand Roman Catholic structure with colorful stained-glass windows, a marble altar, and an observational tower. Sinan Pasha Mosque: A landmark on the city's skyline, this 17th-century Ottoman structure has unique features throughout, making it a crowd-favorite among Kosovo places to see. Germia Park: Scenic stretches of lush green lawns and forestry await you at Germia Park, an excellent hiking and picnic spot. Džamija cara: The exemplary arabesques, delicate design, and surrounding gardens of this 15th-century structure are deserving of a spot on any Kosovo itinerary. Newborn Monument: A city icon, Newborn Monument consists of block letters spelling the word "newborn," erected in 2008 in commemoration of the country's declared independence from Serbia. Kosovo's capital can be known for its crowds, so be wary if journeying to lively Pristina with children on your Kosovo trip. Prizren offers a calmer atmosphere, chock-full of historical sites to spark the interest of visitors of all ages. Active families might enjoy a trip to the the hillside town of Peć, where hiking the natural scenery and attending sporting events offer you some Kosovo vacation ideas. Let little ones' curiosity flourish with a trip to Ethnographic Museum (Muzeu Etnologjik), where children are free to roam the exhibits and marvel at the treasures preserved here; a guided tour can be an engaging way to navigate the displays and also gives them a peek into present-day life in Kosovo. If you need a break from the hustle and bustle of the cityscape, retreat to Parku i Qytetit, a lovely park in the middle of downtown Pristina where kids can run around, play on playgrounds, and get some fresh air. Be very cautious with children crossing the roads in Kosovo, as stop signs and crosswalks are often disregarded by drivers. If you're planning on visiting Kosovo Museum, be aware that some of the images on display are graphic and unsuitable for children. When hiking and camping, do check in advance that the area you are visiting is cleared of land mines. These were used heavily during the war with Yugoslavia, although encountering them now is rare and most suspect areas are clearly denoted in tour books. In general, hiking and camping are very safe, and many popular sites are not where the conflict took place. The cuisine of Kosovo relies heavily on seafood, here you'll find an abundance of trout, seabass, and salmon. Fish are kept fresh in pools and cooked to order. On a Kosovo holiday you'll also find "burek," a baked pastry stuffed with cheese, meat, or spinach. Kebabs are a popular menu item, as is "ayran," a drinkable yogurt that accompanies pastry dishes. If traveling to an Albanian part of the country, you'll find plenty of traditional Albanian food to sample, including "fli," a pastry dish. For an authentic meal in any of the cities, venture a little past the downtown core to the local offerings within the villages. The town of Peć prides itself on its beer production, and even though the country bears a strong Muslim heritage, drinking is quite liberal. If you're visiting Pristina make sure to stop at a local coffee shop for one of their famed macchiatos. Take advantage of your Kosovo trip to buy some of the lovely handicrafts produced here, including filigree metalworks of silver, copper, and brass; wood carvings and engravings; traditional musical instruments; and hand-painted Orthodox icons. Other gift or souvenir ideas include lacework, embroidery, rugs, carpets, knitwear, and leather products. The shop at Ethnographic Museum (Muzeu Etnologjik) sells a selection of these items. For other shopping needs, head to the popular ALBI Shopping Mall, a large, modern mall featuring some big brand names, designer labels, entertainment facilities, and a play area for children. If you're looking for a more authentic experience, haggle your way through the colorful market in Pristina, where stalls of local vendors sell fruits, vegetables, and coffee--plus miscellaneous items ranging from inexpensive clothing to used houseware. Kosovo's history dates back to the Neolithic period. In its early history the area formed the eastern stretches of Illyria, but eventually it became a part of the Roman Empire. During the 5th and 6th centuries it was subject to barbarian raids, and during the 6th and 7th centuries experienced the arrival of the Slavs. By the 9th century the region was part of the Bulgarian Empire and absorbed Orthodox Christianity. The 11th-century arrival of Byzantine armies prompted a military conflict between Byzantine, Serbian, and Bulgarian powers, which ended with Serbia taking control in the 12th century. 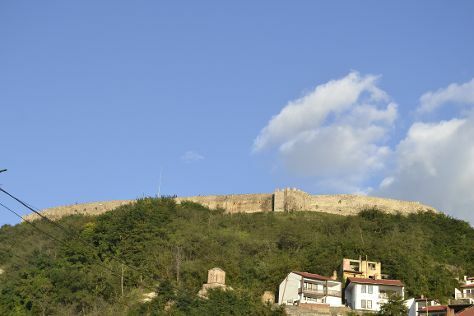 In the 14th century Kosovo served as the seat of the Serbian Archbishopric and the political center of the Serbian Empire, whose headquarters were at Kalaja Fortress. In the mid-15th century power passed to the Ottoman Empire, which then ruled the territory of Kosovo from the 15th to the early 20th century. Get a sense of the atmosphere during this period at Ottoman-era Kosovo attractions like Sinan Pasha Mosque. One of the results of Ottoman rule was a mass diaspora of the Serbian population and, in the early 20th century, the arrival of many Albanian ethnic groups. In keeping with the trends throughout the Balkans, the 19th century saw an uprise in Kosovo nationalism. Many Albanian nationalist movements were based in Kosovo, creating tension between the Muslims and Christians in trying to focus on autonomy and a cultural identity. The early 20th century saw Albanian uprisings, which in 1912 sparked the first Balkan War against the Ottoman Empire. The war's conclusion saw Kosovo divided between Serbia (which got the majority the territory) and Montenegro. The population demographic again shifted, this time with a mass exodus of Albanians and huge immigration of Serbs. In 1929, all four counties of Kosovo became part of the Kingdom of Yugoslavia. When the Axis powers invaded Yugoslavia in World War II, Kosovo was allocated to Italian-occupied Albania. Inter-ethnic tensions continued through the war and after, but post-war Yugoslavia attempted to ameliorate the situation by allowing some 70,000 Albanian settlers into Kosovo while preventing an estimated 50,000-70,000 displaced Serbs from returning to their home there. In 1989, as unrest was brewing in Yugoslavia, the powers in Belgrade revoked Kosovo's autonomous status. The late 1990s saw war break out in Kosovo, with massive violence and displacement of both ethnic Albanians and Serbs. The war ended with a 1999 NATO-led peacekeeping mission, and in 2008 Kosovo finally declared itself an independent republic. Although its status remains the subject of debate (particularly in Serbia, which does not recognize a sovereign Kosovo), you're likely to see plenty of evidence of Kosovar pride on your tour of Kosovo. Visit Newborn Monument to see a tribute to this newfound freedom. In Kosovo, discretion and modesty go a long way. Avoid being loud, rude, or pretentious on your Kosovo vacation. Controversial conversation topics such as politics and finances are generally not advisable. When visiting mosques, it's recommended that visitors cover their shoulders and knees out of respect for the Muslim culture, and women should cover their head. If visiting during a prayer time, you may be lucky enough to be invited to observe; if so, be respectful of the worshippers. When dining, etiquette is similar to the rest of Europe. If dining with locals, the host may offer you the traditional alcoholic beverage of "ravi," and it would be considered rude to turn it down. Kosovo's major holidays center around the country's independence, and on the cultural traditions of Islam and Orthodox Christianity. The residents place great emphasis on February 17, Independence Day, and on Hazu Jehon, a folklore festival held every May in a celebration of traditional music and dance. Every April Pristina plays host to PriFest, an international film festival. If your Kosovo itinerary takes you through Prizren in August, you may stumble across DokuFest, an arts event. Also in August and September is the Prizren Cultural Fair, a great spectacle of handicrafts, traditional clothing, and musical instruments. The climate in Kosovo is continental, yielding very warm summers and very cold, snowy winters. For outdoor adventures on your Kosovo trip, be sure to prepare for the seasonal conditions: bring plenty of water and sunscreen in summer months, and dress in warm layers in winter. During your Kosovo vacation you'll most likely rely on the bus to get from city to city. There's also the option of traveling by train, but the routes are more limited. If going a short distance within the cities, you can opt for public buses--if available, as they are in Pristina--or taxis. The official languages of Kosovo are Albanian and Serbian, with the country's ethnic majority speaking the former. While Serbian is widely understood, it may kick up some dust in places other than the Serbian north (Metohia). The younger generations are familiar with German and English, whereas Turkish is spoken by some older generations. If you're heading to more remote regions on your trip to Kosovo, consider bringing a small phrasebook or dictionary. In Kosovo tipping is not expected, and in the Albanian parts it is unadvisable.